Raila Odinga postpones "Major Announcement" citing new rigging evidence bearer. - Bana Kenya News, Real African Network Tubanane. Home featured Raila Odinga postpones "Major Announcement" citing new rigging evidence bearer. Raila Odinga postpones "Major Announcement" citing new rigging evidence bearer. The NASA leader Raila Odinga has postponed the "word" he wanted to tell Kenyans who support opposition but nothing came out of him today. Many Kenyans were disappointed after they listened to his advice of boycotting their daily activities for him. "We regret that the consultations are taking longer than anticipated. NASA will, therefore, not address Kenyans as projected today." "This is owing to the urgent matters the NASA Summit is handling. Our consultations are ongoing and progressing well," Chief campaigner Musalia Mudavadi said in a statement. The address will be delivered on Wednesday. 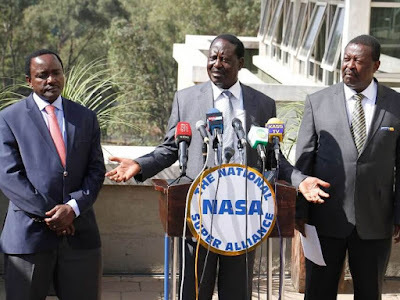 Opposition leader Raila Odinga said they were going to make a major announcement today. This was after he was defeated by incumbent Uhuru Kenyatta on Tuesday last week's election. IEBC figures showed Uhuru won with 54.3 per cent of the vote, ahead of Raila who had 44.7 per cent. Yesterday, a group of people stormed ODM offices in Nairobi to inquire information and submit evidence they collected regarding the vote rigging allegations.